Can Art and Business Work Symbiotically? There is an energy and joy in creating art and a need for tenacity in sticking with it to reach a level of satisfaction and perhaps a tiny bit of perfection. Creativity, in whatever form, has a beneficial quality reaching deep inside. It engenders a gradual inner reforming of self through discipline, practice and, if combined with humility rather than ego, makes the human soul sing. In the past I saw part of my role as an artist to pass on something of the joy of creativity, through giving many courses, private tuition, blogging and such activities including completing many commissions, some of which can be seen in public places in the UK and in Western Australia. 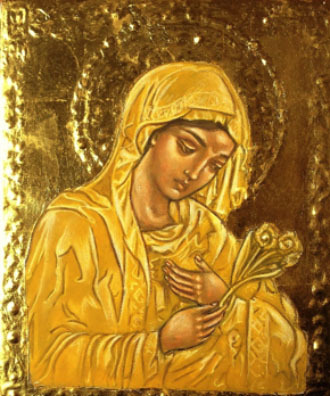 However, for the past five years I have been a professed Tertiary Franciscan, and before that I had specialised in the painting of holy icons in the Russian tradition. This has had no small effect on how I see my creative self. The drive to be an artist has become transformed and subsumed into a greater feeling to see my work as a way of deepening of my relationship with Almighty God. Working prayerfully, in silence and with discipline is part of the process for iconography and I had noticed very soon after starting this kind of work how my own outer life began to be transformed in the most positive of ways. The journey of painting or ‘writing’ an icon is very similar to the journey of the soul. From chaos, and ultimately, to something approaching perfection, through many repeated layers of increasing refinement. The discipline involved mirrors the discipline of the self when surrendering to the Will of God. It can be a joyful experience or one fraught with difficulties and problems – both have considerable value to the process, nonetheless. The success is the acceptance of the process no matter what happens. How does this relate to the world of enterprise and business? What place does an artist have in SESI? The commercialism of art is an illusion concealing the true purpose of creativity. But working from a deep connection of the soul something of the Divine can permeate through into the work and affect, not only the artist, but the observer. Developing a creative niche in all businesses could ultimately have an ordering and stabilising effect on any business. The deeper the connection to the Divine through, not only worship, but creative practice just for the sake of it, could help bring new ideas and ways of overcoming problems. I feel there is an untapped potential to create a better way to do business through the integration – and nota bene! definitely not as an add-on or extra activity – in the workplace by the judicious use of creatives to frame new perspectives and help people discover new depths within themselves. Could SESI become a ground breaker in developing a true symbiosis between day to day business enterprise and creatives? I do not mean hiring a workplace poet or someone to paint images for the canteen wall here, I am envisaging a time when artists, writers, musicians, poets can become part of a business enterprise inasmuch as they help individuals working for companies to reach into and find the creative part of themselves. Because we are created beings and because our creative work is but an imitation of the Divine - it is because it is an imitation of the Divine we become much closer in ourselves to that which is far more perfect than we are. The results would speak for themselves. Yes, I am an idealist, and my dream would require people to get over their limiting views on art and for artists to get over their personal egos for it to work with any degree of success. There is an unlimited place of ideas in the cosmos and creatives are more disposed to tap into it. Is this not a good resource for industry and enterprise to also tap into? Are we in Subud in the business of making new ways for the world to work that will help rather than degrade it still further because man has not yet overcome his need for wealth, recognition and power? My time as a Franciscan, as I get ready to renew my vows for this current year, has shown me the only true profit is the one that comes from a closer relationship to Almighty God and to obedience to His directives. Worldly ‘success’ pales into comparison yet we are surely here to help create something better and perhaps by working in new and innovative ways we can become an example that is positive. Garden of Eden: oils on canvas. Constantina’s work will be the featured exhibition with Subud’s Greenchair Gallery in December 2018 and January 2019. 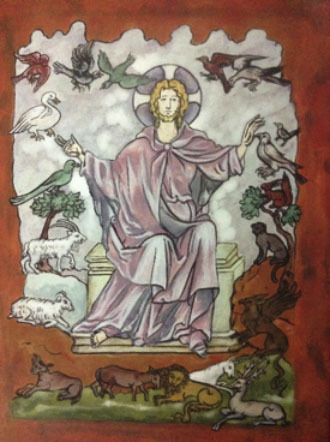 Constantina’s major pieces can be seen at: All Saints, Fulham- Christ Pantocrator and Mary Hodegetria; St. Peter and St Paul’s, Buckingham – triptych of the life of St Rumbold; St Michael’s Priory, Milton Keynes -The Woman at the Well and Archangel Michael; St Peter and St David’s, Bedford – Our Lady of Guadelupe; IHM, Great Missenden, Saint John Paul II; St. Boniface Cathedral, Bunbury, Western Australia – St. John’s Vision of Christ and a beautiful Croix Rousse in Harare, given to Bishop Chad during the troubles there in the church in recent times.